I have found that people love asking for help or they hate it. Now that you are playing a bigger game I want you to help me, help you. I want you to think of the 3 people you would LOVE to hire right now to help you in your business if money was not an issue? Is it a software expert, is it a time management expert, is it an assistant, is it a web/graphic person or is it a marketing expert to plan out all of your marketing? None of us achieve success without help, and it’s way more fun when we do things together! So I want you to consider that the experts you need, are available and a lot more affordable than you think. Just think about this – if you had to replace your bathtub and didn’t know anything about plumbing it might take you all day or end up a total mess. Instead, you might hire a plumber who might cost $200 but have it done in an hour. The same thing goes on in our business right? Don’t waste your time on things that you can delegate to others. Use Odesk.com or elance.com to find the people you need and let’s get out of our own way so that we can ask for the help we need. I recently held a day where I invited brilliant women to come help me with my charity development. THAT was hard – I had never done anything like this before, but what I DID know was that I was getting overwhelmed with the duality of running the charity day-to-day and yet needing to plan for the future of our programs too. Look at the Fun pictures here! It brought tears to my eyes to hear how much they loved contributing and helping the programs grow, and it reminded me that it is such a gift to help others, and sometimes we just need to ask. Whether it is in your business, your life, your health or your marriage I want you to think of one area that you really, really WANT help in? It’s an area that you might need serious transformation in or it might that you just need a little help. Either way we took it as far as we could and then we “come to the end of ourselves” in that area and then what do we do? But very few women take action around their need. So if you need help in life, health or business then start interviewing coaches or consultants that can help you in the area or two that you need. There is NOT a lack of help out there, but sometimes I see women drowning before they will ask for help. Like they need to drowned first then give themselves permission. I would say that is smallness ruling your choices and trying to keep you small, overwhelmed and confused which is the ‘game of smallness’. But if you truly want a life and/or business that is rooted in your greatness then lets make a choice that will empower you and excite you! So if you are struggling with your weight then choose a health or weight loss coach. If you are struggling with your kids choose a parenting coach. If you are struggling with bad habits/addictions choose counseling. 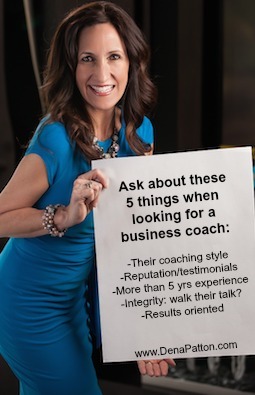 If you are struggling with your business choose a business coach. If you are struggling in your marriage choose a relationship coach. Help. Is. Out. There. Try googling your city and the help you need – for example: ‘weight loss coach San Diego’ and see who comes up and start interviewing them. Not all coaches/consultants/help are created equal so do your homework! 1. What is their coaching style? Make sure you like it. 2. What is their reputation? Look on online, ask for testimonials or a referral you can talk to. 3. How long have they been doing this? You want to look for someone with at least 5 years or more. 4. What is their Integrity like and how do THEY walk their talk? i.e. Don’t get a business coach who has never owned a business. or a marriage coach who is not married but ‘works’ with couples. 5. Are they results oriented or just ‘fluffy’? Can they hear your challenges and solve them so you get on the other side of the issue? I hope this encourages you to invest in yourself and choose the one area that you would like to get help in. Your health, marriage, business or life will thank you! Please comment below if this made a difference for you!